Extra Large Chalkboard Contact Paper Vinyl Wall Decal Poster(Now 9 Feet) Blackboard Roll Adhesive Chalk Board Paint Alternative w/Bonus Chalks - Peel and Stick Black DIY Wallpaper Sizes 17.8" X 108.2"
We Offer Better Quality Adhesive Vinyl Contact Paper in the Market Today with Incredible Low Prices! Our No Hassle Vinyl Contact Paper is ideal for crafts in Homes, Offices, School, Farms or Anywhere Else. - Hours of Incredible Fun For Entire Family - - Try Our Chalkboard Labels and Markers Risk Free with Our 30 Day Guarantee - Satisfaction or Your Money Back! - Order Now Risk Free!! *Write With Our Premium Chalk Markers: https://www.amazon.com/dp/B07J521DHF AMAZING CONTENTS - Brand New Sealed Giant Roll of Vinyl Contact Paper that Unfolds at 17.8" Wide and 9 Feet Long. We Offer 120 Micron Thickness vs Competitors' 60 Micron Thickness! Our Contact Paper Comes With 5 (FIVE) BONUS Chalks. 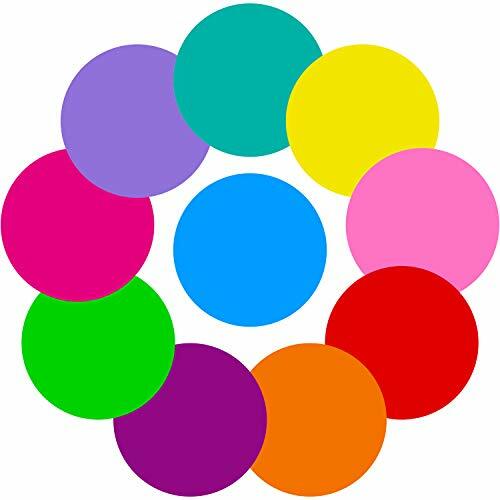 (2 Whites, 1 Yellow, 1 Blue, 1 Pink).  Use Detergent Based Wet Wipes For Super Easy Cleaning Results. Wipe and Toss Away. No Mess Behind. PREMIUM DIY VINYL CONTACT PAPER - Our Contact Paper is Made with High Quality Vinyl, Durable, Re-usable, Strong Self-Adhesive and Water Proof. - Leaves No Residue Behind - Designed with a Matte and Smooth Texture, Not Slippery or Glossy. It Produces a 100% Authentic Chalkboard Look at a Fraction of the Price! SAFE SOUND PRODUCTS - PVC Based, No Odor, Xylene Free, Environment Friendly, Non-Toxic & Great for Kids Age 3+. Writes Well With Regular Chalks or Our Branded Liquid Chalk Markers. These Accessories Make It The Perfect Chalkboard For Kids! Can Be Used As a Kids Room Decor, Child Blackboard, Tutoring Supplies, Kid Wall Art or Home School Materials! Multi-functional Purpose for Any Occasions and Events. EASY SIMPLE APPLICATION -  A Frustration Free Application Experience For 2 People. (One Does Position, One Does Application)  Please Clean Surface Free of Dust And Grease For Best Results.  Avoid Bubbles by Applying The Contact Paper To Surface From One End THEN SLOWLY Peel Off The Back Sheet And Press (w/ Towels) On The Contact Paper In A Forward Motion. Gently Smooth Out Bubbles As You Move.  For Maximum Stickiness, Hang Contact Paper For Flatness For Two+ Days Before Application. LOVE THEM or We Will Buy Back From You with Our 30-Day Money Back Guarantee. No Questions Asked! We Will Promptly Compensate Your Order If There Are Missing Chalks In The Package. Just Let Us Know via Message!  Pinch Lightly With A Bobby Pin To Remove Any Frustrating Bubbles. Click Add to Cart and Get Your Chalkboard Contact Paper Today! Brand: MMFB Arts & Crafts | Manufacturer: MMFB Enterprises Inc. THE Best Selling Whiteboard Contact Paper on Amazon! SAFE SOUND PRODUCTS - PVC Based, No Odor, Xylene Free, Environment Friendly, Non-Toxic & Great for Kids Age 3+. Writes Well With Regular Dry Erase Markers or Our Branded Liquid Chalk Markers. These Accessories Make It The Perfect Whiteboard For Kids! Can Be Used As a Kids Room Decor, Child Whiteboard, Tutoring Supplies, Kid Wall Art or Home School Materials! Multi-functional Purpose for Any Occasions and Events. AMAZING PACKAGE - Brand New Sealed Giant Roll of White Vinyl Contact Paper that Unfolds at 17.8 Wide and 9.0 Feet Long, vs Competitors' Smaller 6.5 Feet. We Offer 120 Micron Thickness vs Competitors' 60 Micron Thickness! Our Contact Paper Comes With 4 (FOUR) BONUS Dry Erase Markers: Onyx Black, Ruby Red, Sapphire Blue & Aquamarine Green Inside The Roll Center. Magnetic Cap With Eraser On Each Marker!  Rest Markers Vertically Tips Down Will Give You The Best Ink Colors. PREMIUM WHITE CONTACT PAPER - Our Contact Paper is Made with High Quality Vinyl, Durable, Re-Usable, Strong Self-Adhesive and Water Proof. - Leaves No Residue Behind - Designed with a Glossy and Smooth Surface, Not Textured or Matte. It Produces a 100% Authentic Whiteboard Look at a Fraction of the Price!  Remove Dried Up Writings Directly With Detergent Based Wet Wipes (ie: Lysol) For Super Easy Cleaning Results (Do Not Use Dry Papers At All). Wipe and Toss Away. No Mess Behind. LOVE THEM or We Will Buy Back From You with Our 30-Day Money Back Guarantee. No Questions Asked! We Will Promptly Compensate Your Order If There Are Missing Markers In The Package. Just Let Us Know via Message!  Pinch Lightly With A Bobby Pin To Remove Any Frustrating Bubbles. Click Add to Cart and Get Your Chalkboard Contact Paper Today! Got a naughty kid who loves drawing and scribbling on your white wall? Finding a place for teaching your kids at home? Or want to decorate your boring white wall? Then Nicpro Whiteboard Wall Decal is an affordable option to use in your kid's room, living room or bedroom! Is this White Contact Paper removable? Is it hard to wipe clean? It's easy to wipe off or clean with a (wet) cloth during use. If the pen ink have been stayed for long time ,you can try to erase with toothpaste, white vinegar, alcohol, soapy water, cleansing oil or whiteboard cleaner. Feel free to contact us if encounter any difficultity. Please feel free to contact us if there is anything missed when received.We provide a no-questions-asked Refund or Replacement! LARGE SIZE: Featuring an extra large size of 17.7" X 78.7", Nicpro chalkboard contact paper is Perfect for homeschooling, office or classroom presentation, decorating restaurant menu boards, living rooms, bedrooms or making chalkboard calenders, schedules, to-do lists, labels, etc. GRID PRINT FOR EASY CUTTING Printed with grids for guiding straight cuts on the backing paper.No need for a ruler, you can cut the white contact paper to any shape or size using the grid on the back as a guide, cover any area, small or large, easy to install. EASY TO APPLY & REMOVE: Backed with premium adhesive, this whiteboard sticker sticks well on most smooth, clean and flat surfaces like plastered wall, painted walls, windows, mirrors, countertops and wooden doors, etc. Easily erase the markings off the whiteboard sticker by damping the cloth. Adhesive is strong enough to stay on a long time but can easily be removed and repositioned. COME WITH FREE BONUS: This whiteboard paper comes with 3 liquid chalk marker for you to write and draw, Red, Blue, Black .They are proved to be acid-free and safe for both kids and adults. 100% RISK FREE PURCHASE: If you are not satisfied with Nicpro whiteboard paper or anything missed when received, we're very happy to either provide a no-questions-asked Refund or Replacement. Order today risk free! ORDER NOW ... LET YOUR CREATIVITY RUN WILD! SPEND LESS, GET MORE! Savvy & Sorted XL adhesive chalkboard vinyl contact paper is 7 FEET long (17.7"W x 84"L) - includes FREE chalk paint marker. NO CUTTING MISTAKES WITH GRIDLINES! Easy to cut in a straight line using the built-in 1/2 ruler and gridlines on the back to measure and cut your chalkboard sticker paper to the exact size required. BE THE COOL PARENT WHO LETS YOUR KIDS COLOR ON WALLS! Turn any flat surface into chalkboard wall art and watch your kids create and play for hours. Stress free clean up when you wipe black contact paper with a damp cloth. Use a magic erase sponge for ink residue! PREMIUM ADHESIVE WILL NOT DAMAGE SURFACES! Made with highest quality, durable adhesive our chalkboard wallpaper is easy to remove, reposition and reuse. Ideal for smooth, clean and flat surfaces including walls, cabinets, refrigerator, desks, books, boxes, containers, dresser, etc. Explore your artsy side. Write thoughts, leave messages and create art no matter where you are in the building. 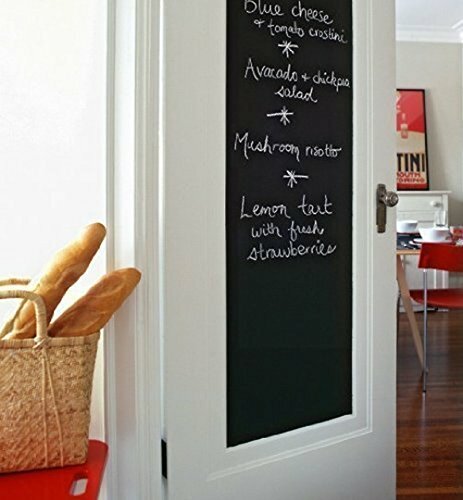 This chalkboard wall sticker quickly applies to any clean, flat surface. It is self adhesive and erasable just like a real chalkboard! Package will include 5 pieces of chalk. 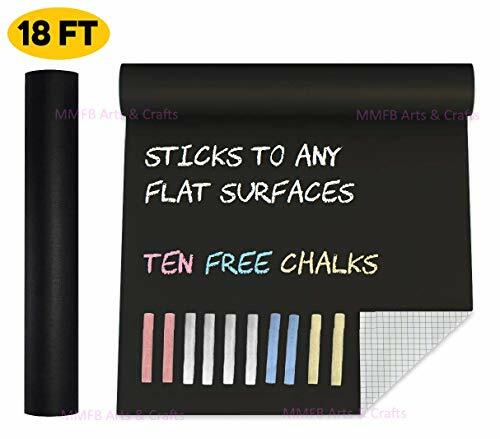 Each roll is 17.7inches x 78.7inches,and you can cut them to your desired size which can be used separately or combined for a large chalkboard writing surface to give you plenty of room for writing menus, sweet messages, to-do lists and more! 5 Chalk and blackboard wallpaper. These accessories make it the perfect chalkboard for kids! Can be used as a kids room decor, child chalkboard, tutoring supplies, kid wall art or home school materials! Chalk board wall sticker is made of black Polyvinyl Chloride (PVC), long lasting quality. Removal is fast, easy and residue-free. Wipes away cleanly from non-porous surfaces with a damp cloth. 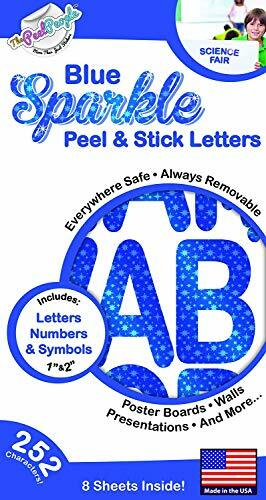 Our Letters & Numbers packs are safe and easy to peel and place. Always removable, repositionable, reusable. No residue or damage. INSTRUCTIONS: 1. Use water and a damp cloth to clean the area where the decal will be applied. Do not use soap. Allow the surface to completely dry. 2. Carefully peel decal from the liner. 3. Apply to smooth, clean and dry surface. 4. To remove, slowly peel the decal from where it's applied, and it will gradually release. Make your next project a snap with 252 easy peel and stick Letters, Numbers, Symbols and Punctuation marks. Everywhere Safe, Always Removable. Perfect for walls, doors, kids room, posters, foam boards, banners, lockers, devices, notebooks, scrapbooks and more. Super easy to apply. Just peel and stick to any smooth, clean, and dry surface. Our adhesive letters go on, stay on, and remove cleanly, never causing damage or leaving residue. Easily removable, repositionable, and reusable. Designed and manufactured in the USA. Acid free. Non-toxic. Extra Large Super Long Chalkboard Contact Paper Vinyl Wall Decal Poster (18 Feet) Blackboard Roll Adhesive Chalk Board Paint w/Bonus Chalks - Peel and Stick Black DIY Wallpaper Sizes 17.8" X 216.5"
The BEST Selling Extra Large Chalkboard Contact Paper On Amazon.com At 18 Feet Long! Comes With 10 Free Chalks. Improved Quality With More Freebies And Value For Our Customers. Click "Add to Cart" and Get Your Chalkboard Contact Paper Today! *Write With Our Premium Chalk Markers: https://www.amazon.com/dp/B07J521DHF AMAZING CONTENTS - Brand New Sealed Giant Roll of Vinyl Contact Paper that Unfolds at 17.8" Wide and 18.0 Feet Long. We Offer 120 Micron Thickness vs Competitors' 60 Micron Thickness! Our Contact Paper Comes With 10 (TEN) BONUS Chalks (4 Whites, 2 Yellows, 2 Blues, 2 Pinks).  Use Detergent Based Wet Wipes For Super Easy Cleaning Results. Wipe and Toss Away. No Mess Behind. Label your bins with our premium vinyl trash, recycle, and compost decal stickers to sort your disposables and recyclables. Being eco-friendly will be one step easier! The large lettering and picture decal is easily noticable, easy to apply, and easy to use. Simply peel and stick the adhesive gloss vinyl to any flat surface. Adheres to almost any type of smooth surface; steel, plastic, glass, dry wall, etc! Our Thick Durable Vinyl Wall Decal is Removable and Without Leaving Any Residue. Proudly made and designed in the USA: the adhesive vinyl window cling stickers are easy to apply and will not leave any bubbles like other wall stickers. Our vinyl wall decal will not leave any residue on the surface of choice they are being put on during removal. At Evolve Skins, we are dedicated to your satisfaction. If you are ever not satisfied with the performance of our product, send it back for a full refund. No questions asked! Don't hesitate and Click "Add to Cart" to buy now! POPULAR GIFT FOR MANY OCCASIONS - Lend a helping hand to your family and friends by giving them this set of cool decorative printing sign logos. Make your next visit a surprise and start stocking up on the cute perfect non magnet housewarming gift, mothers day gift, fathers day gift, birthday gift, gift for teacher, thank you gift, kitchen necessity, home garden essentials, etc! SIMPLY UNBEATABLE - Don't stress about choosing between quality and price. These recycle, trash and compost adhesives are affordable and long lasting. Made with the highest grade vinyl and a finishing coat of lamination, these durable decals offers trouble-free performance and does not leave sticky residues when removed. Unlike the gimmick of competitor brands, our non magnetic print is easy to use; simply peel, stick, and smooth out air bubbles with a credit card. There is no comparison. 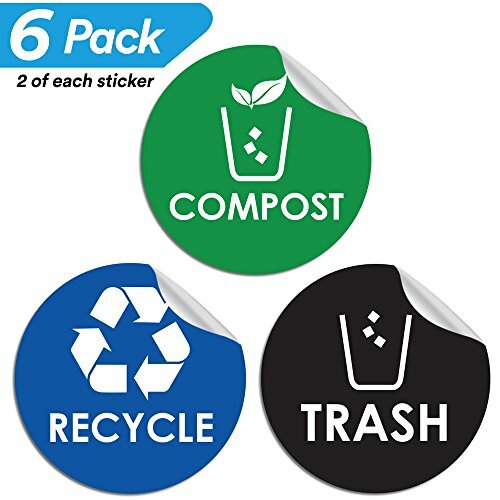 SET OF 6 - (2 Black Trash, 2 Blue Recycle Logo, 2 Green Compost Symbol) - Tired of picking trash out of your recycle bin? These 4 x 4 inch decal stickers with large lettering and graphics picture will help you and your family stay organized. You will no longer see recyclables in the trash can, natural compost waste in your recycle containers, or garbage in your composter bucket. Easily sort items such as bottles, plastic tumbler, aluminum cans, electronics, paper, dump, and hazardous solid. MULTIFUNCTIONAL & VERSATILE - Stay organized with this container sticker. Perfect for outdoor and indoor use on various well cleaned, flat surfaces in your home, office, work, commercial event, apartment, studio, hotel, gym, room, bars, management center, and more to keep clean. They are proven to stick on surfaces such as stainless steel waste bins, glass windows, cardboard boxes, disposal collection trucks, rubbish pail, dumpster walls, etc! You can use these small adhesive labels anywhere! PERFORMANCE & SATISFACTION GUARANTEED - Unlike cheaper counterparts, Evolve Skins is proudly designed and printed in USA. We are dedicated to your satisfaction. If you are ever not satisfied with the performance of your product simply let us know and we'll give you a 100% refund, no questions asked! Get your functional custom kitchen art decor design now! Simply click ADD TO CART and CHECKOUT. It is a small investment that will prevent you from picking junk out of the recycling box again! 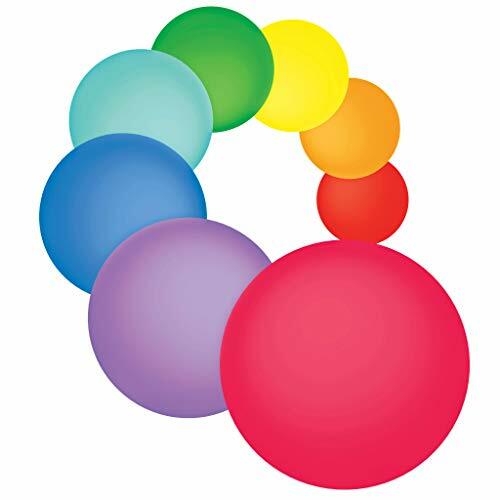 Enjoy a creative environment with our red, green, blue, yellow, orange, purple, magenta, and teal stickers! For Learning Spaces, Offices and More! Students love these stickers that make their learning space more fun. Teachers save time in class by students not needing to find their white boards and get back to their group. Moms can help kids with their work, without carrying around extra paperwork! Useful in offices to centralize/organize lists and reminders or just write down a phone number when you don't have a pad handy! Clean the surface and make sure it is completely dry. Peel off the film edge off the sticker back. Apply small increments to the surface using a ruler or card to create an even result without any bubbles. If bubbles appear, peel off that area and repeat the step before. Press along the edges to make sure the sticker is completely attached and that there are no loose edges. Use the circles with dry erase chalkboard or white board markers and erase preferably using a soft cloth. Our stickers will work better in flat surfaces such as desks, windows, stainless steel and floors. We've used them in walls, but we can't guarantee they will work in every type of wall because of their different materials and textures. Bubbles sometimes are developed from air between the paper and the surface. You could use a needle tip to puncture the bubble! TRANSFORM ANY FLAT SURFACE INTO A WHITE BOARD: With our dry erase stickers of 11 inches in diameter, learning is just a step away with 8 different colors to choose from that will make your desk or wall pop. 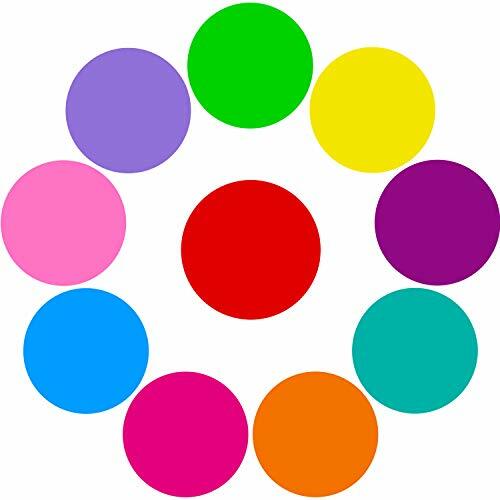 It includes red, green, blue, yellow, orange, purple, magenta, and teal! LEARNING MADE EASY: Make your teaching space more fun and creative with these bright and colorful dry erase vinyl circles. Place them on classroom desks for small reading groups or for students to practice writing letters and spelling words, solving math problems or just taking notes. Put them on the floor for a more dynamic class, or use them on your fridge for grocery or to-do lists. EASY TO APPLY AND REPOSITION: Our dry erase decals are made with exceptional material that can be removed and immediately repositioned without leaving residue. Our superior waterproof quality makes it also easy to erase as many times as you want without losing the brightness of the color or leaving any stains. ECO-FRIENDLY: Enjoy writing and drawing on a surface that can be reused multiple times! No more wasted paper. 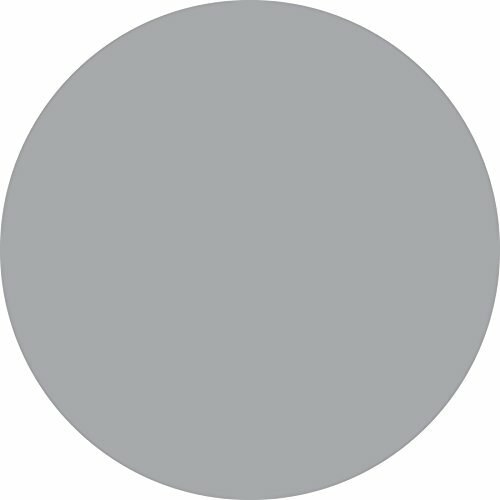 QUALITY ASSURED: Made with premium quality materials, our vinyl circles are guaranteed to last. If you are unhappy with our product, we will refund you, no matter the reason! 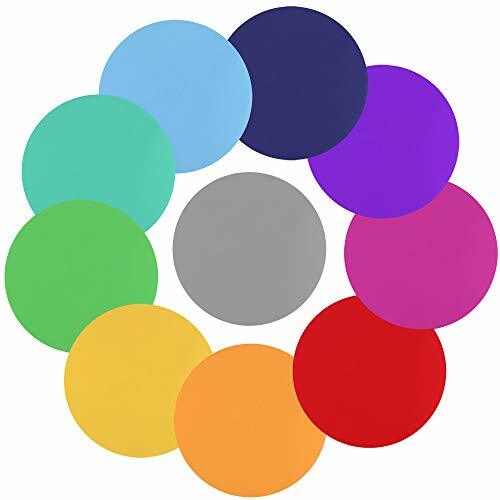 The circle dry erase boards come with different colors in red, green, orange, blue, pink, yellow, purple, malachite green, dark purple, rose red. Fits for teaching and training in classroom, students will love using them to practice writing sight words, solving math problems, even taking notes during a reading lesson or leave a message strip at home. Easy to apply and reposition, take off the white paper then stick on place, safe for walls, leaves no sticky residue, also can be easy to erase. 1. Clean your chosen surface with a damp cloth and dry thoroughly. 2. Gently peel the vinyl circle off of the white backing. 3. Hold the mat with two hands and carefully fold each side up like a taco shell. 4. Place the center fold of the circle onto the table first and then slowly release each side down one at a time. Smooth thoroughly and avoid air bubbles. Tips: if you get an air bubble in your mat, peel back the edge closest to the bubble and carefully smooth it out. Color:Black Regular bulky chalkboards can take up a whole lot of valuable space in the classroom, office, restaurant or home kitchen. This is why we here at FancyFix are delighted to provide our customers with these new innovative Vinyl Peel and Stick Chalkboard Stickers! Remarks for Application: This Chalkboard Stickers work best on smooth surface, flat surfaces, DON'T apply to ROUGH and UNEVEN wall surface. If you are questioning the suitability of a surface,test by applying a small decal to an inconspicuous part of the desired surface and leave for a few days before peeling off. If you are applying to newly painted walls, please allow them to fully dry before using the stickers. Tips for application: 1.Choose a totally smooth surface that is clean and free from dust and moisture. You may use a damp clothes clean thoroughly the applying smooth surface. 2.Peel off the backing paper from a corner, stick to desired surface, use a soft cloth to squeegee out air bubble when peeling off the paper. 3.If you feel it is hard to clean off chalk,pls try to use a wet cloth to clean off it. These peel and stick chalkboard decals are incredibly easy to use and instantly transform your walls, doors or windows into a completely usable chalkboard. All you have to do is unroll the sticker, remove the paper backing and then stick it to a clean flat surface. 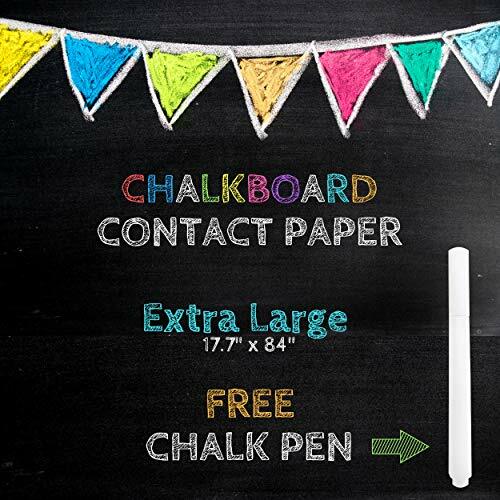 EXPRESS YOURSELF: Use this convenient peel and stick chalkboard sticker to express your creativity with chalk! EASY TO USE: Easy to measure and cut with grid on the back.Simply peel the vinyl chalkboard off of its paper backing and then stick to a smooth flat surface. DURABLE: Made out of a strong vinyl material for long lasting quality. 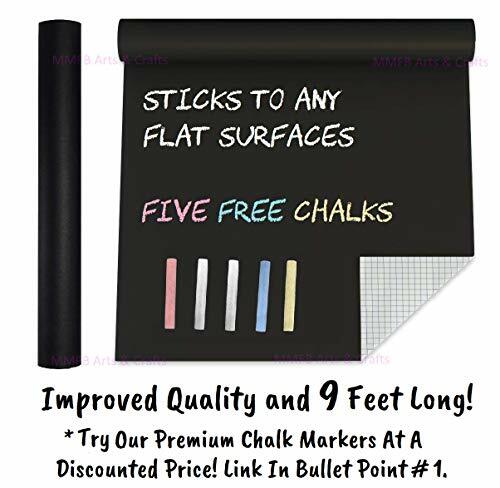 FREE CHALK: 5 FREE regular chalk sticks with your purchase so you can start your writing or drawing as soon as you receive your chalkboard sticker.100% life guarantee! Brand: fancy-fix | Manufacturer: Wenzhou Dekore Home Decoration Co., Ltd.
Due to manual measurement, it allows 1-2(mm) discrepancy. Please be reminded that due to lighting effects and monitor's brightness/contrast settings etc., the color tone of the website's photo and the actual item could be slightly different. Easy installation, simply clean your window and stick it on, water proof / sun proof. No more dealing with suction cup or magnet issues - just peel and apply our sticker to your window and it will stay there. RISK-FREE: Love it or your money back. If you're not 100% happy return it for a full refund. 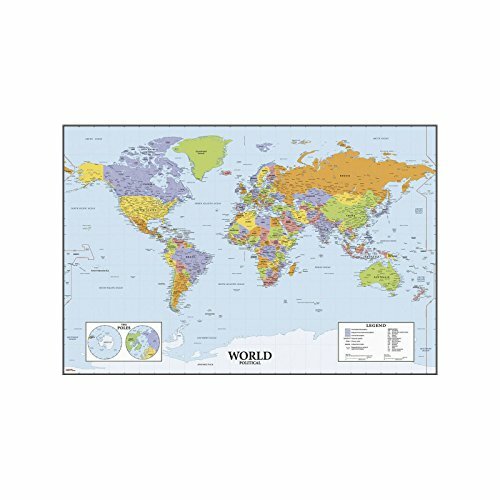 Learn the countries of the world or keep track of your travels with our dry erase world map! Great for any bedroom, office or classroom, this removable and repositionable wall decal can be applied to any smooth, flat surface. Like all Roommates products, the decals won't damage your walls or leave behind any unwanted residue. Take a green approach to writing notes with these chic dry-erase dots! With a stylish metallic sheen, these reusable decals add a beautiful shimmer to walls while allowing you to stay up do date on deadlines, dates and any surprises that may arise. Make the most of your day with this peel and stick wall decor that lefts you be the best you can be! Includes three 13in x 13in dots and a dry-erase marker for your convenience. 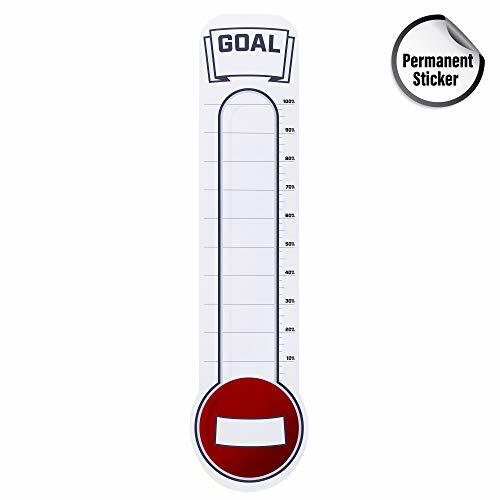 Fundraising Thermometer Goal Setting Chart - Dry Erase Reusable Fundraiser Tracker for Goals Adhesive Decal - 48" x 11"
SIMPLY UNBEATABLE (2 BONUS MARKERS INCLUDED) - Don't stress about choosing between quality and price! This goal setting adhesive chart is not only reusable, but it is also affordable and long lasting, unlike other goal thermometer boards that are complicated to use and easily comes apart. This large motivational dry erase progress decal sticks to surfaces without leaving sticky residue when removed and can also be pinned up and used as a poster as well. PERFECT FOR ANYONE - This giant erasable custom dry-erase fundraiser thermometer can be used by anyone, from small kids to adults. Our blank charts can also be used by an individual, team, family, club, and more. Easy and stress free to use; simply peel, stick, then write & wipe with the red marker provided. If there are bubbles, easily fix that by using a credit card to flatten it out. Reach your goals and reward yourself with prizes, games, toys, a big bonus, or even a vacation trip! MULTIFUNCTIONAL & VERSATILE - What better way to motivate your team than with this fun meter tracker! Being able to visually see your goals and accomplishments builds up excitement, and makes you and your team eager to reach that goal. 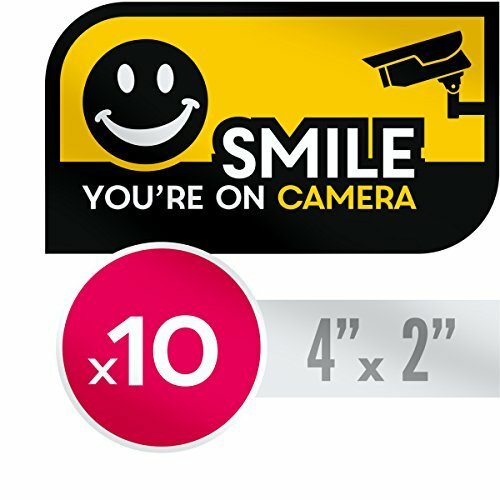 This vinyl sticker can be used indoor or outdoor at your work meeting office, classroom, retail business, family room, school bulletin, churches, kids playroom, commercial organization, and more to meet sales goal, fundraising charity donation, milestones, etc! POPULAR GIFT FOR MANY OCCASIONS - Lend a helping hand to your family, friends, and team by giving them this wall tracking tool. Make your next visit a surprise and start stocking up on these decals that will not fall apart like the cardboard thermometers and that is versatile. Perfect gift for bosses, coworkers, CEO, school, teacher classroom, YMCA, boy scouts, girl scout, Christmas gifts, white elephant gift, thank you gift, birthday gift, last minute fast shipping gift, work essentials, etc! PERFORMANCE & SATISFACTION GUARANTEED - Unlike cheaper counterparts, Evolve Skins is proudly designed and printed in USA. We are dedicated to your satisfaction. That is why we can offer a manufactures 90 day money back guarantee. If you are ever not satisfied with the performance of your product, simply let us know and we'll take care of you! Get your company team work essential now! Simply click ADD TO CART and CHECKOUT. It is a small investment that will deliver tremendous benefits! Bonus: 6 Whiteboard Markers Inside! 2 Rolls of Longer and Thicker Dry Erase Paper Each roll measures 118*17.7 inch (L*W). Made of thicker vinyl material and strong adhesive, the dry erase wall decal won't fall off easily. 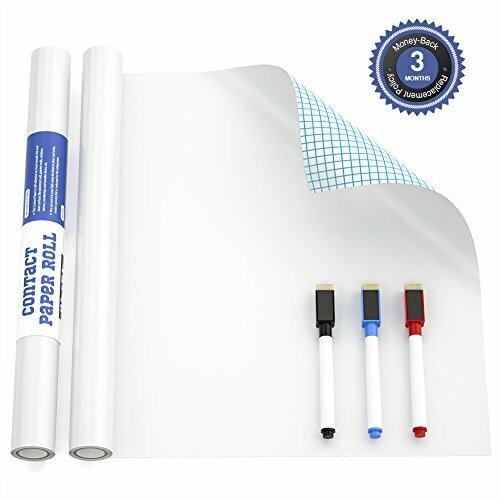 Peel and Stick Whiteboard Paper Simply peel off the backing paper from one corner and stick to any clean and smooth surface. To apply the entire dry erase wall decal, we suggest two people work together and use a soft cloth to avoid wrinkles and bubbles. 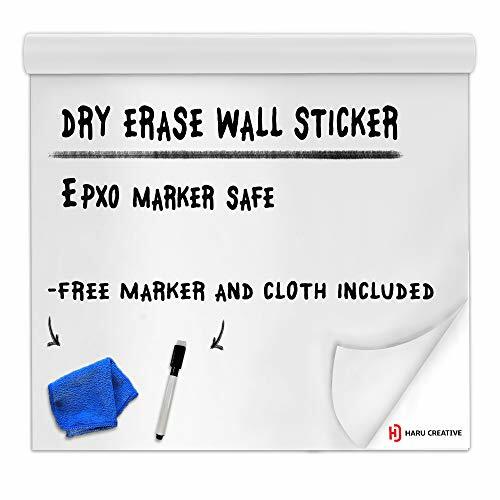 Easy to Remove and Clean The dry erase contact paper is easy to remove and the marks are easy to clean without any residue. 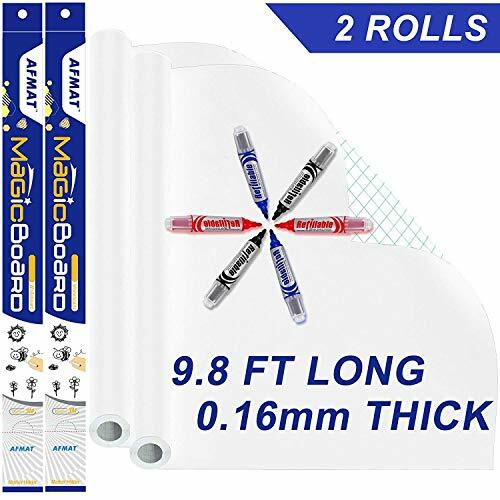 Multi-functional White Board Paper Use it as a traditional white board or a projector curtain wall, this dry erase board sticker can also be posted on the arc-shaped surface and cut into any shape. 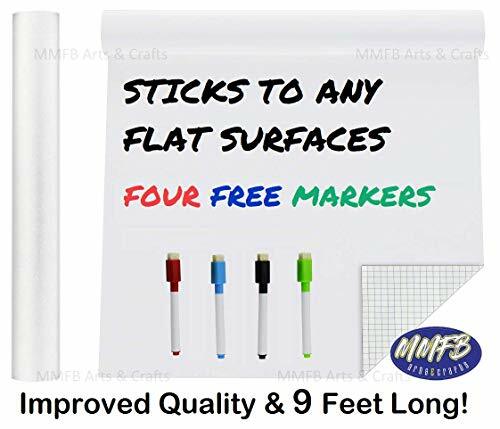 6 High Quality Whiteboard Markers This whiteboard stickers come with 6 free markers. 100% RISK FREE PURCHASE - Try it today with the security of our 365-Day Money Back Guarantee - no questions asked. Haru Creative offers a wide assortment of high quality vinyl adhesive film so you can express your creativity exactly how you want. - Apply and safely remove from any smooth surfaces! 7) Take your time and grab an extra set of hands to help you if needed. Let us show you that we care about all our customers, 100% satisfaction guaranteed! *Please contact us if you run into any issues and our customer support team would be more than glad to assist you! EASY TO USE - Use your creativity and turn an ordinary surface into a ready to use dry erase board for endless possibilities. Works with all dry erase and Expo Markers. Our adhesive whiteboard can be cut to any shape desired and works on smooth surfaces. Just peel and carefully stick. Using a squeegee is helpful when applying a larger size whiteboard sheet. MULTIFUNCTIONAL - Great for everyday use, work/business, signs, school, studying, children, and so much more. Perfect for smooth walls, glass, wood, metal and other everyday surfaces such as cabinets, doors, refrigerators, tables and more! CREATE - Think outside the box! Use for parties with friends/family. Liven up a special event or game night, perfect for children who love to draw, get ready to bring the whole family together with our whiteboard! Whether you have children or run your own fantasy football league, this is for you! EASY TO REMOVE - Once you are ready to remove from your surface, our high quality vinyl backing will not leave any unwanted residue or stains. QUALITY - Unlike ordinary stick and peel sticker boards, our high quality sheets come in multiple easy-to-use sizes, can be cut to any shape without a simple pair of scissors (no special tools required). All our products are backed by our 100% guaranteed satisfaction. If you ever have any issues, please contact our team that is ready to help. PUT UP ONE SPOT AND MOVE TO ANOTHER: This decal is designed to allow you the flexibility to move it from location to location. Just be sure to find a smooth, clean surface and remove with care. You'll be able to reuse this decal over and over! 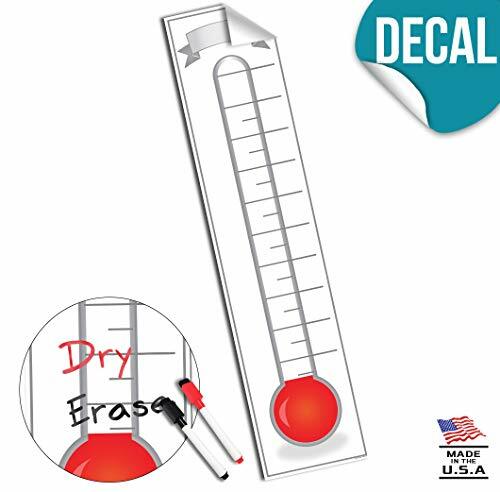 EASY TO CLEAN: Write ANYWHERE on the dry erase thermometer decal and wipe away easily. Simply use a wet cloth or paper towel with cleaner to completely erase the marker and start fresh! CUSTOMIZABLE: It doesn't matter what you're tracking, it can be done with the ORCA Thermometer Tracker. Whether it's monthly sales, annual fundraiser donations, or anything else - This thermometer goal tracker makes it fun! NO FRAYED EDGES: Our stickers are packed in a protective tube with about a inch of extra paperback on the edges of the sticker. This prevents any creases or damage to the stickers during transit! MOTIVATE YOUR EMPLOYEES: Visually tracking your goals has been proven to improve performance. This thermometer goal tracker is a fun way to keep your team engaged! Material:Vinyl . Non-toxic, environmental protection, waterproof ! Pre-cut, Peel & Stick ! Won't leave a mark on your wall,You can put it by yourself indoors or outdoors: walls, doors, windows or any flat and dry surface! Easy to Apply, Removable, Durable, Pressure Resistance, Shock Resistance, Moisture Resistance They're always awesome cool unique gift ideas for people. Add one or several wall stickers to your cart now! SUPER STICKY ADHESIVE: Place this decal on a smooth surface and don't worry about it coming down. The super sticky adhesive on our permanent decals will hold for a VERY long time.